Come run with your pooch and benefit Charlie's Place. Come run with your pooch and/or check out the animals available for adoption at Charlie’s Place in Dumont. ​​Sponsored by Clear Creek Recreation Center and Charlie's Place. 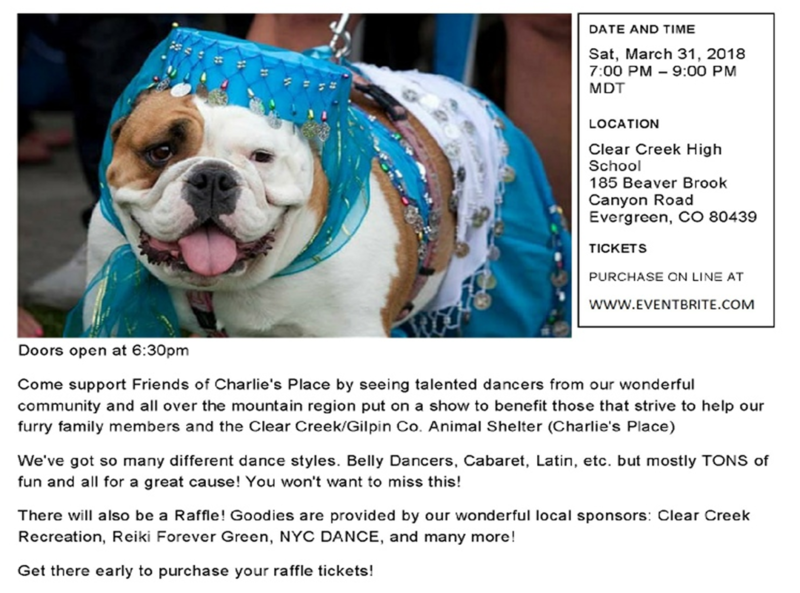 ​Come support Friends of Charlie's Place by enjoying talented dancers from our wonderful mountain community. We have many different dance styles: Belly Dancers, Cabaret, Latin, etc. but mostly a lot of fun for a great cause! Come Help us appreciate our Veterans! We are raising funds for Majestic Krewe of Mountain Mutts, an organization dedicated to raising funds for Veteran services and their service animals. We will be hosting a parade, canine costume contest, raﬄe, and a “Crowning of the Royal Court”, along with various activities recognizing local Veterans. Gilpin High School's Homecoming parade is this coming Friday, October 12th, 2 pm with staging at the Teller House parking lot in Central City. Come meet a shelter dog and enjoy an afternoon with them. We will be holding a companion animal remembrance ceremony Sunday, August 12, from 11 a.m. to 12 p.m. in the Helen Buck Memorial Park on the shelter grounds. This is for anyone who has lost a beloved pet and would like to honor their memory. All proceeds from services done this day will be donated to Friends of Charlie's Place. Parade Location: 6th Street (Georgetown, Colorado). Post parade picnic and adoption event - 12:00 noon at Town Park. Come help us celebrate the 4th and meet our adoptable pups from Charlie's Place. We'll see you there. Race Location: Exit 216 off I-70 (Loveland Ski Area/US Hwy 6). Post Race Celebration and Adoption Event: Setup by 11:00 am on 6th St. in Georgetown. Come help us celebrate the Slacker Race participants and meet our adoptable pups from Charlie's Place. We'll see you there. Come run with your pooch and/or check out the animals available for adoption at Charlie’s Place in Dumont. ​Sponsored by Clear Creek Recreation Center and Charlie's Place. 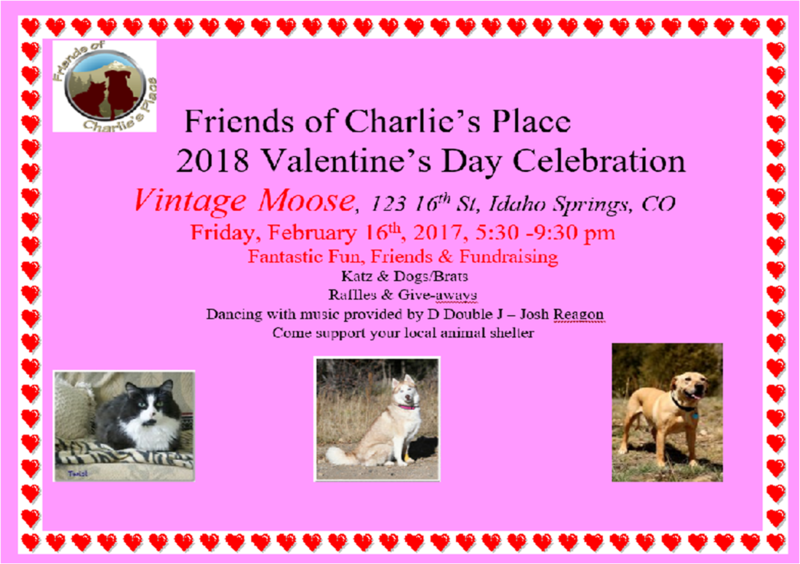 Come support Friends of Charlie's Place by enjoying talented dancers from our wonderful mountain community. We have many different dance styles: Belly Dancers, Cabaret, Latin, etc. but mostly a lot of fun for a great cause! thanks to our dedicated and hardworking volunteers and staff at Charlie’s Place. 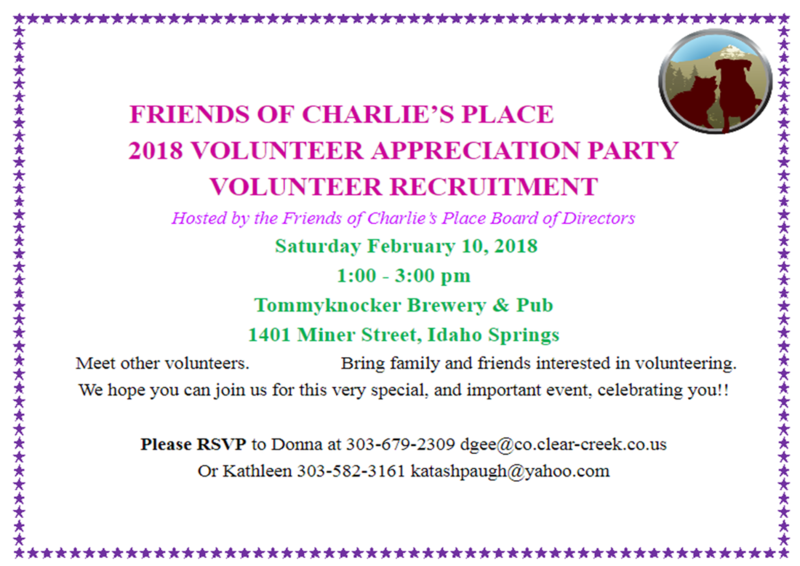 Please join us for our 2018 Appreciation Party. Come support Friends of Charlie's Place by attending the Spring Rhapsody dancers benefit! Join us for our annual Valentine's Day Celebration at the Vintage Moose. Enjoy music, dancing, and great food!